Abstract— Nowadays, the air pollution increase significantly. Transportation is the main cause of the increase in air pollution. This is cause of its growth, vehicle number growth rapidly. To solve this problem there was made electric cars. Electric cars have zero emissions. However, the electric car has the disadvantage that the high cost of batteries, short distances and inadequate infrastructure. One type of vehicle powertrain has been developed. That is plug in hybrid vehicle (PHEV). PHEV use two source of energy for vehicle they are battery and fuel. It makes PHEV less emission than conventional vehicle. Indonesia is also currently running a program of emissions reduction and fuel savings. So the use of PHEV to Indonesia can be proposed. This study focused on analysis well to wheel fuel economy and emission of conventional and alternative vehicle (PHEV) in Indonesia This study used Surakarta to represent Indonesia’s vehicle speed character. Advisor used to compare conventional vehicle and PHEV in fuel economy and emission. The result of this study is PHEV 31,85% more economy than conventional vehicle. And PHEV less emission than conventional vehicle about 41.3% for HC, 46,8% for CO and 17,5% for NOx. From the results of this study, the PHEV has a great opportunity to replace conventional vehicles as a means of transportation in Indonesia. Nowadays air pollution increased significantly, and the main factor that caused it is the vehicle . Significant growth vehicles made air pollution rises precipitously. In addition to air pollution, fuel consumption of vehicle was highest. In Europe the use of CO2 limits have been imposed so that the development of vehicles that can minimize CO2 emissions now been developed [3,4]. One of the vehicles that can be used is an electric vehicle [5-8]. Electric vehicles have zero emissions levels and fuel use. However, this solution affects the cost of the battery, mileage, and the infrastructure for charging batteries [9,10]. A better solution is to use hybrid vehicle. plug in hybrid vehicle (PHEV) can increase fuel economy of the vehicle and decrease its emission. usually PHEV called less emission vehicle . Indonesia is also currently running a program of emissions reduction and fuel economy. This is evident from the government policy on emissions and the use of renewable energy. The growth of vehicles in Indonesia is also very significant that need the vehicle models that have high fuel economy and low emissions. System of hybrid vehicles can be offered to solve this problem. Focus in this study is the use of PHEV in Indonesia are represented by one of the city namely Surakarta. Surakarta is one of the cities in Central Java which was getting to be a crowded city, even the slogan from Surakarta is the spirit of java so expect Surakarta could be a model use of hybrid vehicles in the study. Plug in hybrid vehicle is a vehicle that uses a minimum of two power sources. Hybrid vehicles are divided into three based on the configuration of its powertrain the series, parallel and series parallel. Series PHEV is a PHEV vehicle that uses the motor as a major driver while the ICE is used only to charge the battery. Parallel PHEV vehicle is a PHEV that uses a motor and ICE as a major driver, while the mixture is PHEV that use ICE vehicle and the motor as the prime mover, but ICE also works for charging the battery. The main components of PHEV are battery, motor, ICE, transmission and vehicle body. This study uses the contours of the vehicle speed at the town line solo. Contour speed obtained by driving a conventional car around town solo. Results contour used for simulation speed and conventional hybrid vehicles as the input speed. The road to pick up speed data looks like the figure 1. This study used simulation-based on Advisor . Advisor is a program designed specifically for vehicle simulation. Specifications used vehicle is a vehicle PHEV whose data was taken from NREL. The specifications can see at table 1. Speed of vehicle as input at this simulation. In this study used flow simulation as method of simulation. Back flow simulation is speed as input and fuel consumption as output of the simulation. ICE engine was the most importance one of this study. ICE engine efficiency map can be seen at figure 2 below. Conventional vehicle used to define speed chart in Surakarta city. In Surakarta many traffic jams that make vehicle can’t be accelerate and must be stopped. The characteristic of speed vehicle at Surakarta can see at figure 2. This speed chart used as speed input at both of PHEV and conventional vehicle. PHEV and conventional vehicle compared at fuel economy and emission. Figure 3 shows that torque of conventional vehicle higher than PHEV. It is make fuel consumption higher than PHEV. If the fuel consumption higher automatically fuel economy must decreased. Figure 4 indicate that the power of batteries used to support vehicle power. The power batteries decrease is delivered to the motor. Motor supported ICE to supply power of vehicle. Fuel rate of conventional vehicle higher than PHEV. It is depending of torque requirement of ICE. At figure 3 shown that torque requirement of conventional vehicle ICE higher than PHEV. In other hand, speed chart take effect of torque requirement. The more stop, leads higher torque requirement. from the result of this study, about fuel economy and emission, fuel economy and emission depend on main source of energy. Conventional vehicles have less fuel economy and higher emission than PHEV’s. P. Nunes, T. Farias, M. brito. Day charging electric vehicles with axcess solar electricity for a sustainable energy systems. Energy 2015;80:263-74. Through a relationship with the Museum of Science, Boston, the team will also create an interactive exhibit to teach and inspire future scientists and engineers. 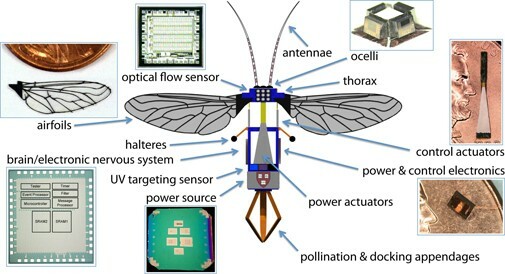 From flies to fish to lobsters, small insects and animals have long been ideal models for roboticists and computer scientists. Bees, for example, possess unmatched elegance in flight, zipping from flower to flower with ease and hovering stably with heavy payloads. 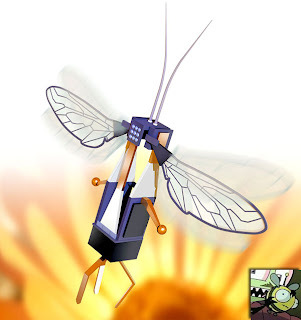 By leveraging existing breakthroughs from Professor Wood’s Microrobotics Lab, which conducted the first successful flight of a life-sized robotic fly in 2007, the team will explore ways to emulate such aerobatic feats in their proposed devices. In addition, achieving autonomous flight will require compact high-energy power sources and associated electronics, integrated seamlessly into the ‘body’ of the machine. One of the most complicated areas of exploration the scientists will undertake will be the creation of a suite of artificial “smart” sensors, akin to a bee’s eyes and antennae. Professor Wei explains that the ultimate aim is to design dynamic hardware and software that serves as the device’s ‘brain,’ controlling and monitoring flight, sensing objects such as fellow devices and other objects, and coordinating simple decision-making. Finally, to mimic the sophisticated behavior of a real colony of insects will involve the development of sophisticated coordination algorithms, communications methods (i.e., the ability for individual machines to ‘talk’ to one another and the hive), and global-to-local programming tools to simulate the ways groups of real bees rely upon one another to scout, forage, and plan. The investigators, primarily based at Harvard’s School of Engineering and Applied Sciences, will coordinate efforts with faculty from the Department of Organismic and Evolutionary Biology in the Faculty of Arts and Sciences at Harvard and Northeastern University’s Department of Biology. In addition, Centeye, a microelectronics firm in Washington, D.C., specializing in vision chip and visual sensor technology, will contribute technical knowledge. A number of the collaborators are core faculty members of the newly created Wyss Institute for Biologically Inspired Engineering. As the work fits particularly well with Wyss’s mission of “creating new materials and devices using Nature’s design principles,” the Institute, along with SEAS, will play a critical role in supporting the research, providing laboratory space and in-kind financial support. Harvard is one of three lead institutions receiving the latest round of awards under the NSF’s Expeditions in Computing program. The program, established last year by the Directorate for Computer and Information Science and Engineering (CISE), provides the CISE research and education community with the opportunity to pursue ambitious, fundamental research agendas that promise to define the future of computing and information and render great benefit to society. Funded at levels up to $2,000,000 per year for five years, Expeditions represent some of the largest single investments currently made by the directorate. The robot consisted of a number of sensors and actuators, involved in various different tasks. *For collision avoidance, two medium range IR sensors (crossed) and one short range IR sensor were used. Additionally, to act as a 'back up' should something hit the robot, a bumper with a microswitch was placed on the front. 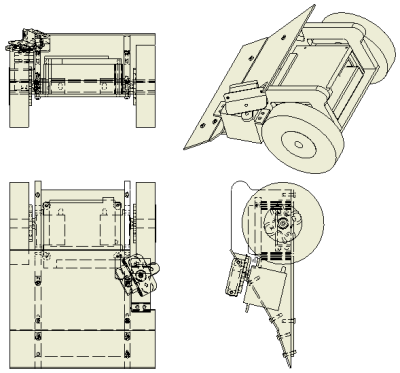 *For the firing mechanism, the IR emmiter gun was placed on a turret at the front, which consists of a cog connected to a servo by a chain. The IR emmiter was controlled by an infra-red controller circuit, which was essentially just a remote-control. The controller has a permanently depressed button, and the IntelliBrain would supply power to it when the signal needed to be sent. The ammunition lights were connected to and controlled by the IntelliBrain. 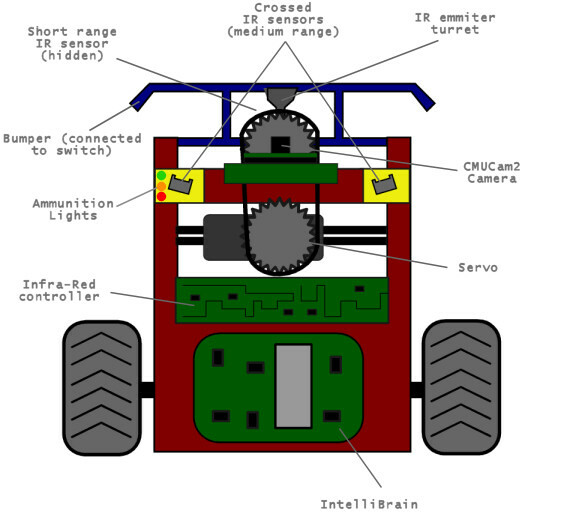 *For the colour blob tracking, the CMUCam2 was mounted at the front, slightly higher than the turret and other obstacles, to give it a clear view. Our infrared firing mechanism consisted of a modified remote control and a custom built receiver. The circuit diagrams and operational information for both parts are given below. Since the remote control switches under the physical buttons are carbon contacts it is impractical to activate the remote control by electronically “pressing” a button. As such the remote control has one button permanently pressed by taping a carbon contact over a button. Using the IntelliBrain as a power source for the remote control is not possible as the output voltage of the IntelliBrain is approximately 5V and the maximum rating of the IR encoder on the remote control is 3.3V . Also, the current provided by the IntelliBrain would not be high enough to operate the infra-red emitter of the remote control. As such, the firing is controlled by switching on and off the battery power supply to the remote control. When the IntelliBrain digital I/O port is set high, the base (b) current of the BC108 NPN transistor is enough to switch on current flow between the collector (c) and emitter (e) , saturating the transistor. 3V is then supplied to the remote control by connecting the positive supply terminal to the emitter and an IR pulse train is fired. 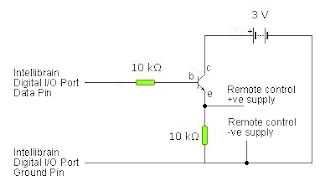 The resistors in the circuit are for current limitation purposes to protect the transistor. Two modifications were made to the remote control. Firstly, the infrared diode was desoldered from the circuit board and connected to long wires to allow aiming of the emitter. Secondly, the onboard power supply decoupling electrolytic capacitor had a value of 47µF. This capacitor suppresses voltage fluctuations in the power lines of the whole remote however it prevented rapid switching of the power supply to the remote control by the IntelliBrain. A new capacitor of value 1µF was wired in place to allow power supply switching whilst also smoothing the power supply. The TSOP1738 is an integrated IR receiver, decoder, noise filter and preamplifier that responds ideally to IR coded signals transmitted on a 38kHz carrier wave. As an active low device, the quiescent output voltage is the positive supply, in this case 4.5V. 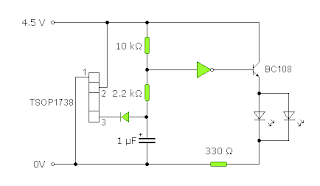 When a signal is received by the TSOP1738, the output drops to 0V and spikes either side of 0V to provide the decoded IR signal. In this application, the decoded output is not important, however negative voltage spikes are very dangerous for CMOS based logic devices and would destroy the chip that follows in the circuit. The diode at the output of the TSOP1738 prevents the output dropping below 0V, and, in conjunction with the 1µF capacitor and resistors, suppresses the decoded output spikes. 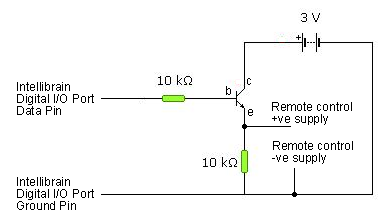 This part of the circuit provides an output of 4.5V when no signal is detected and slightly above 0V when an IR signal is received. 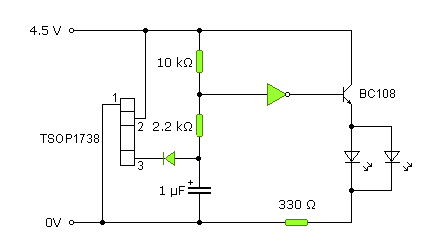 The NOT gate (part of the CMOS logic chip mentioned previously) then inverts the signal so that when a signal is received, 4.5V is presented at the logic output. Low power CMOS chips cannot provide the necessary current to drive an LED so this output is connected to the base of an NPN transistor. The transistor acts as a current amplifier and lights the two LEDs whenever a signal is received, with the 330Ω resistor operating in a protective capacity. The original receiver design included a hit counter with seven-segment display. This worked by using the output of the TSOP1738 and associated circuitry, as shown above, as the input to a BCD counter. Standard counter and display circuitry was used from that point as can be found easily online. Unfortunately, in practice, the circuit did not work when connected to the battery pack despite being quite reliable on prototype board when connected to a power pack. The exact reason for this is unclear but several factors may be involved. The CMOS logic components used were chosen for their low power consumption and fast switching speeds to make them compatible with the output of the IR receiver. CMOS chips are sensitive to unstable ground connections which may be experienced when using battery supplies. Secondly, any IR noise that was not filtered by the TSOP1738 would cause spurious counting. Finally, long wires were used to connect two parts of the circuit together due to the initial constraints of working with the laser-tag drone. The robot lab is subject to lots of interference from mains and network cables in the walls and the wires would act as an aerial. In low power devices, this interference may be enough to cause unusual behaviours. Build a quality robot for under $50 - on your own! Before we get started, I want to tell you about the motivation behind writing this tutorial. I remember back when I began building my very first robot. I had been wanting to build robots for years, since 3rd grade actually. I was completely fascinated by them. But unfortunately I never had any outside influence to do this - none. Not a single person I knew understood what even a resistor was good for, even through highschool! No one to help me, no one to explain anything, no guidance from teachers, no SoR either! I bought robot like toys, dabbled with electronics, but didn't have a clue on where to start. Nature, failed by nurture . . .
Then in my sophomore year in college, I took my first robotics class. The professor gave us an optional project to build our own robot, and offered money to anyone up to the challenge. It was my chance! Still had no idea what I was doing, but I had money to do it! I immediately started drawing up plans, and began talking with people. Still clueless, I spoke to two mechanics, a biochemist, a CS prof. Combined I knew enough to go to Home Depot and buy a bunch of steel beams that I knew somehow magically connected together. Soon after, I remember walking into the CMU Robotics Club and saying 'I have these steel beams and I want to cut them to size, how do I do it?' At first confused by my high level of incompetence, they agreed to show me how to use the bandsaw. From that point on, if I needed help, I knew where to find it. Ok so my first robot was a complete failure, but its where I learned all the basics to get me started on my own . . . and the rest is history . . .
As you have realized, SoR has been the outside guidance people need. Got a question? Post it in the forum. Need expertise? Read the many tutorials. But what I haven't offered, at least up to now, is an opportunity. One more thing before we begin. Ask yourself how serious you are about robots. Do you just want to just try it out? Maybe make something for your child to learn with? Perhaps encourage your highschool students in the direction of engineering? Or do you want to study it in college? Maybe you want robotics to be your professional career? If you fall in the latter two categories, you need to stop being cheap. Seriously, if you want to be a professional, you need to go all out. Buy yourself some good equipment, make investments in robot parts, don't cut corners because of cost. Of course, you don't need to go out buying $5k laser rangefinders, but don't spend 10 hours making an accelerometer when you can buy one for $10. If you are a serious builder, build/buy your robot parts under the assumption they will be scraped for robots in the future. Beginners often spend between $100-$400 for their first 2 or 3 robots, while experts spend about $0-$40 for their robots. Why is this? Its because they made the long-term investment. If you are going to build robots the rest of your life, spend for the long term. The investment will pay for itself. In all honesty, you may end up spending $150+ for this robot, but if you are willing to make the investment, in the long term it will pay off. Either way, I will give multiple options throughout the tutorial to match each persons wallet (or lack of). Speaking of which, are you just too poor to invest? If you want to know more about paying for robots, read my robot funding tutorial. As I mentioned, I will teach you the process of making a robot, as you make it. The very first step anyone would make would be to design your robot. Interestingly this is where beginners fail. Beginners spend 90% of their time building, and 10% designing. Experts are the opposite - 90% designing and 10% building. Of course when you are a beginner its hard to design - you dont always know what works until you try it. But planning never hurts. Typically the design phase is an iterative process/cycle between design and part selection, meaning the designer juggles between the design he would like, and the affordable parts available on the market. The designer will keep redesigning until both reach a harmony - often a long and tedious task. There have been several times where I spent a week designing a circuit, only to find out a key chip I need has been sold out and no longer exists! It forces me to redesign the whole darn thing. Pain! But lucky for you, I designed this robot using highly available, easily replaceable components. For this tutorial you can mostly skip the design/part selection phase, but its still a very important skill you will need to learn. In the future, if you are looking for robot components, I have written up a robots parts list to save you time. Starting you off, these are the parts you need to purchase. Buy them right after you read through this tutorial, but before you start building anything. That way the parts have time to ship while you are building the robot chassis. Note that some of the parts in the optional list can replace the more expensive parts in the required list. Also, some members have complained about shipping practices at Digikey.com, so just search for the parts at mouser.com instead if you feel you may have a problem. You will need one of the listed programmers (I will explain the difference later in part 4). Part costs may change due to market factors. Last price update Dec 2008 . . . prices go up with inflation so at some point it'll be over $50 for sure! Although not necessary, I posted the datasheets of all parts (4mb) for more information. If you live in Britain, a generous user has suggested this parts list to save you money in shipping. Thanks Paula! And if you live in Australia, Smash has suggested this parts list. Ok so to be honest, you will probably have to spend more than $50 on your robot. This robot was designed to use parts you are likely to have around your house, or that can be borrowed from friends or school . . . but if you like live in a box, and don't have friends or something, you might have issues finding these items. If you cant find any of these items, your local hardware store will have them. Remember, if you are serious about robotics, make an investment in good tools and equipment. What Kind of Robot Are We Going to Build? In one sentence: we are going to build a differential drive robot, using the photovore algorithm, with photoresistors, capable of basic object avoidance. This means your robot can run around your house without running into objects such as furniture and your cat . . . preferably just the furniture . . . Please read those tutorials before continuing, as they can give you a fundamental knowledge of what we will do in this tutorial series. You have probably noticed how I often divide robotics up into these three separate categories - such as I do in the forum. This is because making robots involves three independent skills. Only combined, can you make a functioning robot. When a robot designer makes a robot, he has to account for all three in the design phase so that each falls into balance. But for this tutorial, I will do one at a time to make it easier for you to understand. First will be mechanics where we build the robot, then electronics where we hook up the brains and sensors, and finally software will be written to program the robot. A community wants to construct a robot zoo in which the "animals" move their heads, open their mouths and make appropriate sounds when they sense that someone is coming towards them. Design and build a prototype device which could satisfy this need. A local pet shop wishes to sell a range of devices which automatically feed small cage pets (such as rabbits, gerbils, mice etc.) when their owners are away for the weekend. Design and build a prototype device which could satisfy this need. You need to determine what problem you are trying to solve before you attempt to design and build a robot to solve a problem. Take the time to study a number of different situations and once you have decided what the situation is and you understand exactly what the problem is then write a design brief in a log book (this will be your working document as you work on your robot. This log book can be a paper notebook or an electronic document.) This is a short statement which explains the problem that is to be solved. Having written a brief, you are now ready to gather information which will help you to produce a successful design. First you will need to decide what information you require. This will be different from project to project and will also depend on the amount of information and knowledge you already have. A useful step will be to use the following chart. Ask the five questions, then read the column headed Gathering Information. This will help you plan the type of information you will need to gather. * movement How will the robot move within its environment? If it were put in a different environment, would it still be able to move within this new space? * manipulation How will the robot move or manipulate other objects within its environment? Can a single robot move or manipulate more than one kind of object? * energy How is the robot powered? Can it have more than one energy source? * intelligence How does the robot "think?" What does it mean to say that a robot "thinks?" 2. What part does appearance (shape and form, surface texture, colour, etc.) play in the design's function? What does the robot look like? Is there a reason for it to look as it does? Surface texture, finish and colour can be appropriate to a design's:aesthetic qualities, mechanical, optical and thermal properties, durability, etc. 3. What materials are suitable for the design? The properties of a material will determine its suitability for a design. For our work with robotics we have chosen to work with LegoT™. However, there are many different types of materials that can be and are used in the construction of robots. * and the aesthetic qualities determined by colour, surface texture, pattern, etc. The materials cost and availability are also important factors. 4. What construction methods are appropriate to the design? A particular material can only be worked in a limited number of ways. The method of construction therefore will be determined by the chosen material, the availability of manufacturing facilities, the skills of the work force and the production costs. 5. What are the likely social and environmental effects of the design? The manufacture, use and disposal of any product will have both beneficial and detrimental effects upon people, wildlife and the environment. The designer therefore, has an enormous responsibility to consider very carefully the potential effects of any new design. This will include: health and safety factors, noise, smell, pollution, etc. Gathering information can involve reading, listening, conducting interviews and observing. A specification is a detailed description of the problem to be solved. It should 'spell out' exactly what the design must achieve. You should ideally think of at least three different ways to solve the problem before you concentrate on any one in particular. Sketches and notes are required at this stage. You can also create prototypes using lego for this step. Once you have created a lego prototype, take a digital picture of it. Print out the picture and jot your notes below the picture in your log book. Once you have settled on one solution, go back over the list of specifications you have made. Make sure that each specification is satisfied. Now it the time to produce some working drawings. These are the drawings that will assist you as you begin constructing the prototype of your structure. (Here again, lego and a digital camera might be your best friend.) You may choose to do your drawings by hand or you might want to use a draw program on the computer to assist you. Determine a working schedule for yourself. Draw up a timetable showing how much time you expect to spend on each part of the design process. Your planning should also ensure that you have all the necessary materials and equipment that you need to complete your project. Robolab™ has two levels for programming. Once you have written your program and downloaded into the RCX brick using the Infrared Sender, it is time to test your robot to see if it truly does what you want it to do. caused more than 100.000 deaths and milion of injuries. Robots which have three linear (prismatic joints P, as opposed to rotational R joints) axes of movement (X, Y, Z). Used for pick and place tasks and to move heavy loads. They can trace out rectangular volumes in 3D space. The positions of these robots are controlled by a height, an angle, and a radius (that is, two P joints and one R joint). These robots are commonly used in assembly tasks and can trace out concentric cylinders in 3D space. Spherical robots have two rotational R axes and one translational P (radius) axis. The robots’ end-effectors can trace out concentric spheres in 3D space.